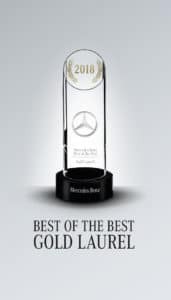 RIDGELAND, MS (March 26, 2019) – Mercedes-Benz of Jackson has been honored by the luxury automobile brand as a Best of the Best for 2018, recognizing it among the upper echelon of Mercedes-Benz dealerships nationally. The Best of the Best Program distinguishes dealers based on exemplary performance in sales, service and parts as well as excellence in operations and customer experience. Mercedes-Benz of Jackson was named Best of the Best Gold Laurel, placing it among the top 10 percent of dealerships in the United States. Higginbotham Automobiles – which owns Mercedes-Benz of Jackson – also earned Best of the Best Gold Laurel for its Mercedes-Benz of Collierville dealership outside Memphis. “Our overriding priority is to deliver the ultimate customer experience when someone enters our dealership, whether that is for a vehicle purchase or for a maintenance or service visit,” said Trudy Higginbotham-Moody, co-owner and president of Mercedes-Benz of Jackson. “Best of the Best is an indication that we are successfully providing exceptional service at a more-than-competitive price, and it speaks volumes about our sales and maintenance associates. The Higginbotham family constructed and opened the new Mercedes-Benz of Jackson dealership in 2017 after outgrowing its previous location. The 70,000 square-foot facility, located in Ridgeland, offers a full line of new and previously owned Mercedes-Benz automobiles, as well as a service department with the latest diagnostic technology. “Our promise is to treat our customers well and go that extra mile to meet their automotive needs,” said Higginbotham-Moody. “As a result, our customer loyal through the years have enabled us to grow.